See how your love of cottage cheese can get you entered to win a prize pack valued at $200! 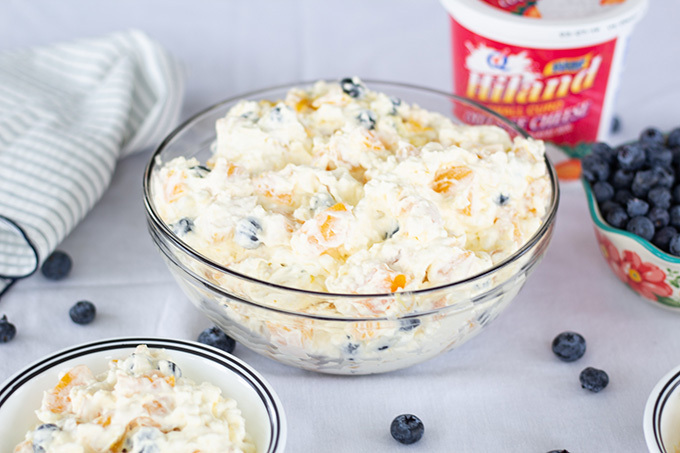 Peach Blueberry Fluff Salad combines canned peaches, fresh blueberries, vanilla pudding, cottage cheese and whipped topping to make a healthier dessert. 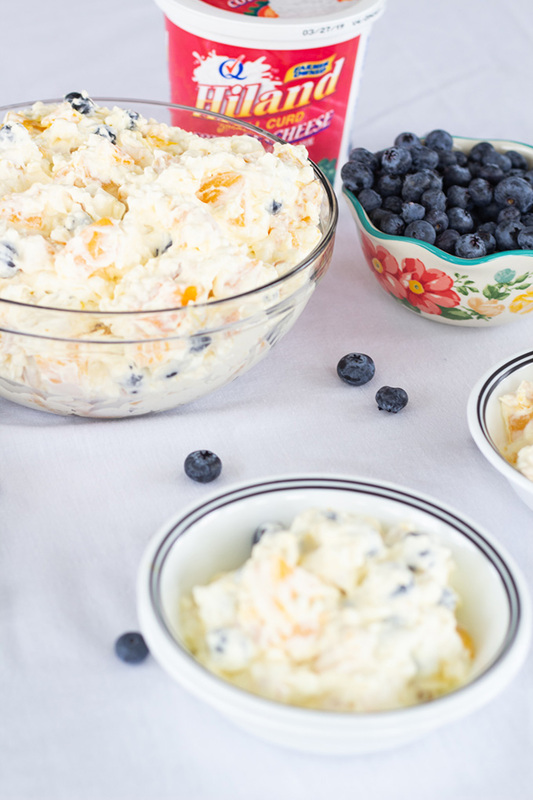 This five-ingredient Peach Blueberry Fluff Salad is what I like to call a healthier dessert. I am a big fan of dessert, in fact, I like to eat a little dessert nearly every night. Making a version that is better for me allows me to have my dessert without feeling guilty. And adding Hiland Cottage Cheese gives us some extra protein. I eat it cottage cheese almost daily in the lunch I take to work. I like that it helps me to feel full until dinner time. It is also low in carbs. It seems that the older I get the more I try to cut out carbs. I usually add a little fresh or canned fruit, or tomatoes. I also eat it plain, with a little salt and pepper. Sometimes my husband puts a little sugar on his. It takes him back to his childhood because he has been eating it that way since he was a little boy. Using Hiland Cottage Cheese in recipes is a great way to add nutrition in foods such as pancakes, pasta dishes, smoothies, bowls, and even cake. You can google recipes such as cake and cheesecake with cottage cheese and find many different recipes to choose from. I have made a chocolate bundt cake using cottage cheese in place of some of the butter and it was delicious. I just used my immersion blender to puree it. It was kinda the texture of sour cream. Check out the Hiland website where you can learn more about Hiland dairy, find recipes, get coupons, and enter into a giveaway to win prizes! Giveaway prizes include a blender, mixing bowls, measuring cups and spoons, and product coupons. Drain peaches and cut into bite-sized peaches. 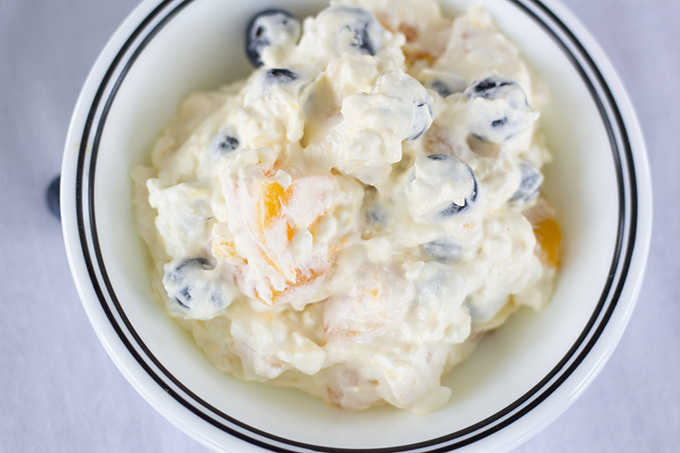 In a large bowl combine the Hiland Cottage Cheese and vanilla pudding mix.